This week the U.S. Supreme Court issued a ruling that sided with pregnancy resource centers in California. Watch the video below to learn more. 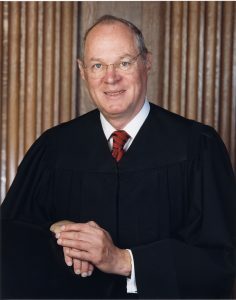 Today U.S. Supreme Court Justice Anthony Kennedy announced he is retiring from the court at the end of July. Justice Kennedy has long been considered a pivotal swing vote on the court. In 2015 he authored the U.S. Supreme Court’s opinion that abolished state marriage amendments like Arkansas’, but he also was instrumental just this week in striking down a California law that targeted pro-life pregnancy resource centers. Justice Kennedy’s retirement means President Trump and the U.S. Senate soon will take up the task of nominating and confirming a justice to fill the vacancy he leaves behind. President’s Trump has indicated that the process of finding a new Supreme Court Justice will begin right away. Justice Kennedy’s replacement could drastically change the direction of the court — shifting the U.S. Supreme Court farther to the right or to the left. This is an opportunity to replace a swing vote on the court with a conservative vote. Needless to say, a lot is at stake. Yesterday the U.S. Supreme Court issued a very important, pro-life opinion in favor of California’s pregnancy resource centers. The ruling struck down a California law that required pregnancy resource centers to tell women that abortion is available at little or no cost; the law also required the centers to give the women a telephone number to call to learn more about qualifying to have an abortion paid for with tax dollars. Needless to say, a lot of misinformation has been spread about the law and about yesterday’s court decision that struck it down. Below is a brief overview of the implications of this good court ruling. As the Supreme Court noted, California’s law was intended from the start to single out pregnancy resource centers for special regulation. Writing for the court, U.S. Supreme Court Justice Clarence Thomas noted that California’s law targeted pregnancy resource centers, requiring them to tell women about abortion. The law was written in such a way that it applied to pregnancy resource centers that provide women alternatives to abortion, but it exempted other types of facilities that work with female patients. [A] facility that advertises and provides pregnancy tests is covered by the [law], but a facility across the street that advertises and provides nonprescription contraceptives is excluded [from the law]. Simply put, the state doesn’t have any business singling out pregnancy resource centers and requiring them to promote abortion. It’s important to note that many pregnancy resource centers are faith-based and exist to give women real options besides abortion. They provide pregnancy testing, ultrasounds, adoption referrals, maternity clothes, and diapers, and other resources — typically free of charge. California’s law effectively required the centers to do abortion referrals as well. In their lawsuit against the State of California, the pregnancy resource centers argued the state law violated their religious liberties and their rights to free speech. This week the U.S. Supreme Court agreed. After a lengthy legal battle, the U.S. Supreme Court ruled 5-4 in favor of the pregnancy resource centers. The court made it clear California’s law burdened the pregnancy resource centers’ religious liberties and their right to free speech. With this ruling, the U.S. Supreme Court once again upholds Americans’ First Amendment rights to free speech and the free exercise of religion. In recent years, the ACLU and others have targeted Christians who want to operate according to their deeply-held convictions. The U.S. Supreme Court has ruled in favor of religious liberty repeatedly. The government cannot force someone to violate his or her religious convictions, and it cannot stop someone from living out his or her faith. This week’s ruling upholds the religious liberties of pregnancy resource centers. That helps reinforce the court’s past rulings in favor of religious freedom as well. Abortion advocates have tried to paint pregnancy resource centers as “fake medical clinics” that promote junk science. The truth is pregnancy resource centers empower women with real options besides abortion. Many of them offer state-of-the-art, medical-grade equipment and services. Many provide ultrasounds and pregnancy testing. Most offer maternity clothes and baby supplies. Many also provide parenting classes or counseling services. Best of all, these services typically are provided to women and their families free of charge. California’s law singled out pregnancy resource centers and subjected them to unnecessary regulations that required the centers to violate their deeply-held religious convictions. The Supreme Court’s ruling affirms that pregnancy resource centers are legitimate organizations that have the same liberties as anyone else. Abortion advocates have tried to compare California’s law to informed-consent laws the courts have upheld repeatedly. Informed-consent laws require abortion doctors to give women all the facts about abortion beforehand — including abortion’s risks, consequences, and alternatives. In Arkansas, women who receive this information must be given at least 48 hours to weigh all their options before the abortion can be performed. Some have tried to argue that California’s law is no different from these informed-consent laws — that it simply requires pregnancy resource centers to tell women all of their options. However, the court disagreed. In Planned Parenthood of Southeastern Pa. v. Casey, for example, this Court upheld a law requiring physicians to obtain informed consent before they could perform an abortion. . . . The licensed notice at issue here is not an informed consent requirement or any other regulation of professional conduct. The notice does not facilitate informed consent to a medical procedure. In fact, it is not tied to a procedure at all. It applies to all interactions between a covered facility [pregnancy resource center] and its clients, regardless of whether a medical procedure is ever sought, offered, or performed. In other words, the fact that a doctor has to tell a woman about the risks and alternatives prior to performing a surgical abortion on her doesn’t mean pregnancy resource centers have to promote abortion to everyone they see. A few people worried that the Supreme Court would threaten informed-consent laws like Arkansas’ if it ruled in favor of California’s pregnancy resource centers. However, the court ruling clearly does not. It protects pregnancy resource centers from regulations that single them out for opposing abortion, but it does not threaten pro-life informed-consent laws like Arkansas’. That’s good news. Read the entire U.S. Supreme Court ruling here.